Nick Naitanui has started his career with two exciting games that have the AFL community buzzing. With his stunning performances interest in talent from the Fijian-Australian's ancestral home must be at an all-time high. This makes the establishment of AFL Fiji all the more timely. The initial meetings will be held in Suva on July 10th and 11th. The first meeting is open for all interested people to discuss AFL Fiji. 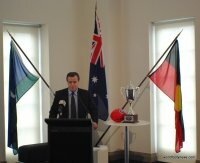 AFL Oceania Development Manager Andrew Cadzow has said that they will advertise this through all papers and media. The second meeting will be the first formal meeting of the steering committee of AFL Fiji. Cadzow says, "Very important we get as many as possible to the first meeting to ensure we add to the quality of our steering committee. At the second meeting we will be outlining and planning for the commencement of AFL Fiji including Junior Development, Talent Pathway, Auskick (Fiji Kick), Competitions, Finances, Resources, Academy, Volunteers/Staffing/AYAD, Formalising Advisory board". The meetings will be hosted by Cadzow and steering committee chairman Damian Ames. "We are looking at an 8-10 person Committee with representatives from all regions, Nadi, Labasa etc. As well as Australia".